Concave Faceted 34.58ct Half Moon Shaped Ametrine. Rough came directly from the only mine producing this material and was hand-selected for our specialty cuts. Faceted by our award winning concave cutter in this wonderful complicated and time-consuming style. 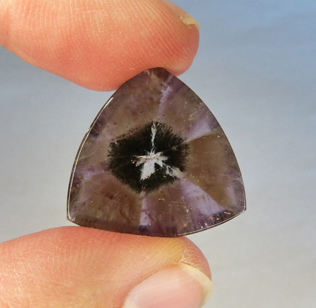 The cutter requires about 5 days or more from the time he begins to work the rough to completion of the final gemstone. The process is not typically completed over a 5 day period, but usually a month, as the artist takes a break and works on other material as this particular cutting style is labor intensive, requires total concentration and quite a bit of pressure to obtain a final high polish. Issues and unforseen problems can occur at any time, and therefore, more time, energy and effort extends the timeframe before a gemstone may be finished. (ajml-16b-01d) Contact us for pricing. One says WOW when viewing this Fancy Blended Ametrine! Click on the above photo for a larger image. A 45.60ct Concave Cut Blended Ametrine in a uniquely shaped oval, showing the Amethyst and Citrine as separate areas within the gemstone, but also causing some blending which adds interest and beauty. This was photographed with a ring light which allows proper even lighting to see the color patterns/cutting throughout the gem. Our connections to the mine that produces this material, allows us to obtain the unique pieces of rough we require to produce such beautiful treasures. The rough is personally selected for All That Glitters. We do anticipate (or perhaps better said - we 'hope') beautiful gemstones will result from our rough by our cutter, but sometimes the custom design the cutter has chosen and the one-of-a-kind rough we supply him, turns into something far beyond what was originally expected, as is the case of this piece as well as a custom created fancy fan shape (incorporating grooving, faceting and even optical dishes in the design shown below). So unique and beautiful are these, that we have been comtemplating entering them into the ATGA Cutting Edge Competition when that is held in the future. 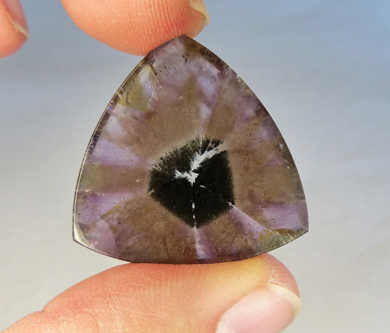 The negatives to entering these gemstones into this contest include waiting for the contest to begin, the high entrance fees ($300, not to mention the cost of shipping and insuring the gems in full) and the fact that if the judges agree about the uniqueness of the cutting/shape/color, etc. the gemstones are not returned to the owner for quite a long time as they go on tour to be admired by others in the trade. We do have a price in mind per carat for these pieces, and we feel due to the size, the uniquenes, the rarity of the starting material as well as other pluses, that our price is a very good buy and far less the retail price we have seen for smaller Ametrines with less interesting cuts and where the color zoning is more of the norm of what one sees in 'everyday' Ametrine. Feel free to email us to inquire about the price. Measures approx: 26.6x19.2x164.mm (ajml-16-01f) Contact us for pricing. Okay....(pause).....I don't even know what to say. I've never seen anything like it?? oh. my. goodness. That is seriously stunning work. All I've got is gibberish and odd noises. Wow. Wow, wow and more wow. Seriously beautiful. 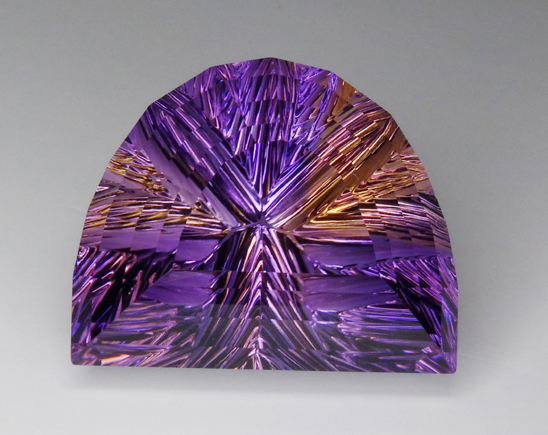 This may be THE most amazing Ametrine faceting I have ever seen. 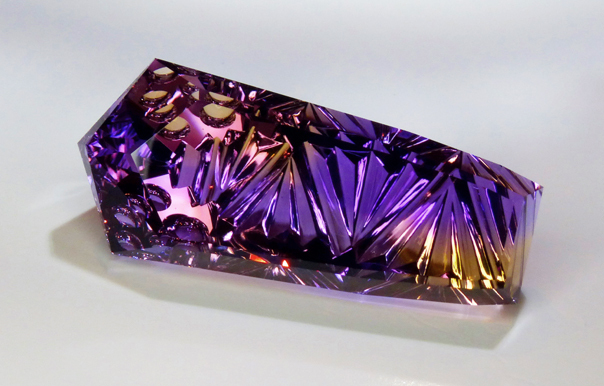 56.64ct Kite Shaped Concave Ametrine. 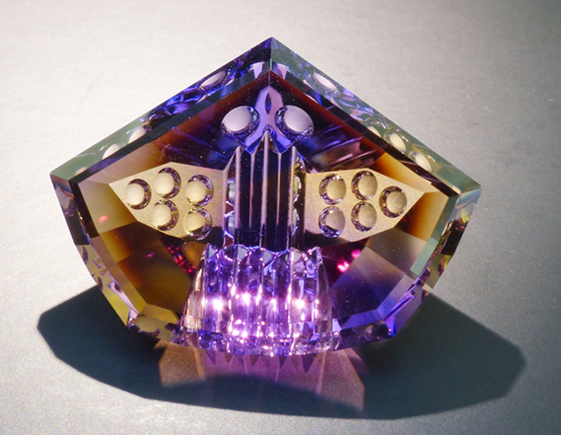 Concave Faceted 56.64ct Kite Shaped Ametrine with Optical Dishes and More! Rough came directly from the only mine producing this material and was hand-selected for our specialty cuts. Faceted by our award winning concave cutter in this wonderful complicated and time-consuming style. 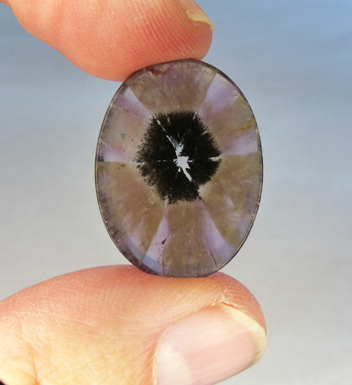 The cutter requires about 5 days or more from the time he begins to work the rough to completion of the final gemstone. The process is not typically completed over a 5 day period, but usually a month, as the artist takes a break and works on other material as this particular cutting style is labor intensive, requires total concentration and quite a bit of pressure to obtain a final high polish. Issues and unforseen problems can occur at any time, and therefore, more time, energy and effort extends the timeframe before a gemstone may be finished. This exceptional design is another possible contender for a cutting award. (ajml-16b-01i) Contact us for pricing. 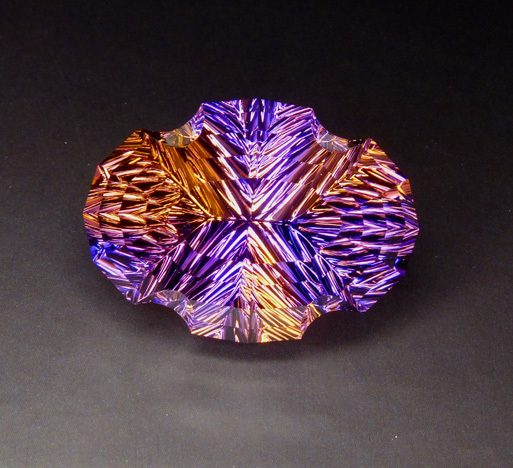 Yes, Another WOW in a Fancy Blended Ametrine! 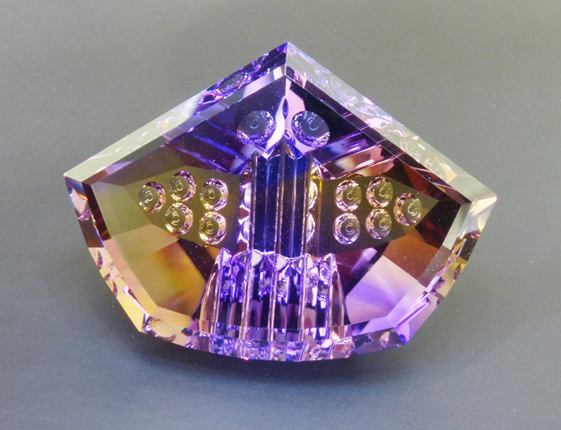 A 70.20ct Concave Cut Blended Ametrine in a custom created fancy fan shape, showing the Amethyst and Citrine as separate areas within the gemstone, but also causing some blending which adds interest and beauty. The first photo was taken under office fluorescent lights. The second photo is partially backlit which allows details to clearly be shown as it is transmitted light vs. reflected light. Our connections to the mine that produces this material, allows us to obtain the unique pieces of rough we require to produce such beautiful treasures. The rough is personally selected for All That Glitters. We do anticipate (or perhaps better said - we 'hope') beautiful gemstones will result from our rough by our cutter, but sometimes the custom design the cutter has chosen and the one-of-a-kind rough we supply him, turns into something far beyond what was originally expected, as is the case of this piece as well as the fancy oval shape above. So unique and beautiful are these, that we have been comtemplating entering them into the ATGA Cutting Edge Competition when that is held in the future. 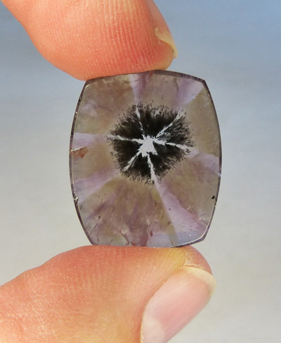 The negatives to entering these gemstones into this contest include waiting for the contest to begin, the high entrance fees ($300, not to mention the cost of shipping and insuring the gems in full) and the fact that if the judges agree about the uniqueness of the cutting/shape/color, etc. the gemstones are not returned to the owner for quite a long time as they go on tour to be admired by others in the trade. We do have a price in mind per carat for these pieces, and we feel due to the size, the uniquenes, the rarity of the starting material as well as other pluses, that our price is a very good buy and far less the retail price we have seen for smaller Ametrines with less interesting cuts and where the color zoning is more of the norm of what one sees in 'everyday' Ametrine. Feel free to email us to inquire about the price. (ajml-16-01e) Contact us for pricing. Said to be from the Aracuai area of Brasil. for inclusion in Gems & Gemology Magazine, Summer 2018 Edition!